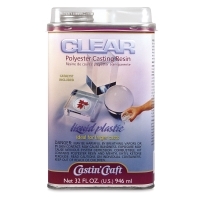 The versatility, lightness, and affordability of polyester resin has increased in popularity as a material for making jewelry, paperweights, and other decorative items. When mixed with a hardening catalyst, Castin'Craft Clear Polyester Casting Resin forms a glass-like coating, making it easy to encapsulate found or textured objects. Finished pieces can be painted and textured to resemble ivory, horn, bakelite, or amber. 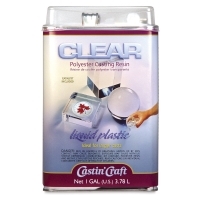 Castin'Craft Clear Polyester Casting Resin includes a bottle of catalyst, which can be stored in the resin container's bubble-top cap. 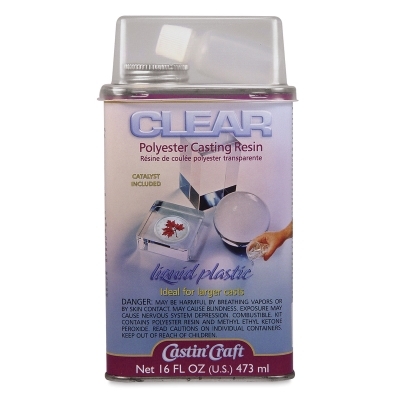 Note — Casting resin has only a 6-month shelf life. Store in a cool place. 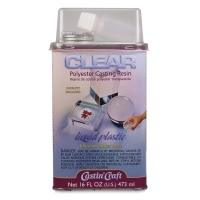 Polyester Catalyst — Clear, colorless liquid, very low viscosity. Usually added in quantities of 0.5% to 3.0% of weight of resin for curing. Store in a cool place, keep tightly closed. Purchase ½ oz for a pint or quart of resin, and 1 oz for a gallon of resin.